An electric collar with a hand held remote is not "off leash"
Many people shutter at even the thought of their dog being off leash. However, if the dog can't be trusted when the leash is off, there will always be that element of fear. Even though there are leash laws, and the dog should always be on leash, accidents happen. Doors are left open, leashes break, collars come off, gates aren't closed all the way, and so forth. If the dog is not trained off leash, and he does get loose, not only could he be in real danger, but he could put others at risk as well. There are two types of off leash training and the approach is very different for each. 1. Dogs that don't come when called. 2. Dogs that heel off leash. 1.) 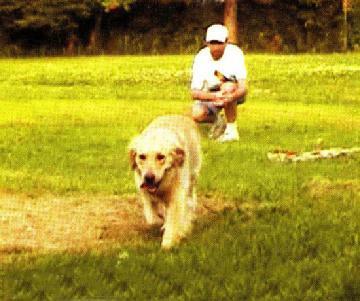 Having the dog come when called ensures that the dog will stay near you and not run off. The dog does not have to be in any particular position in relation to the owner. Click here to see "Why Dogs Don't Come When Called." 2.) Having the dog heel off leash signifies that the dog stay at the owner's left side, his neck even with the owner's left leg. The dog is expected to maintain this position if the owner walks, changes pace, direction, or stops, no matter what the distraction. In order for the dog to work off leash, he must first be trained to walk properly on leash. This means on a "loose leash." 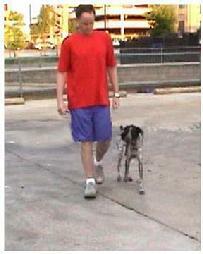 The term "loose leash" refers to the leash being loose enough as to not be felt by the dog. With the leash connected to the dogs collar, and holding one strand of leash in the left hand, the leash should form the letter "U" with the bottom of the "U" being even with the dogs elbow. Done correctly, it takes no more than 20 minutes to teach the dog to walk on a loose leash, and about 5 weeks for the dog to be consistent and 100% reliable off leash. Walking the dog with a tight leash, or tightening up on the leash when the dog starts to pull, not only encourage the dog to pull by creating a "tug of war" effect, but actually prevents the dog from learning how to walk off leash. Stopping and making the dog sit every time he starts to pull also does not teach the dog to walk politely on a loose leash. Ineffective training aids such as harnesses are designed to teach dogs to pull. Halties and Gentle Leaders don't train, they restrain. Off leash cannot be accomplished with these devices. If the dog is restricted from advancing forward on leash, he will more than likely bolt when the restriction is removed. Training the dog to walk on a loose leash eliminates this contrast, so when the leash is off it feels no different than when the leash is on. Dogs of any size allowed to pull can damage their windpipe. Buckle collars and incorrectly used choke chains cause the most harm. Micro fractures occur in the cartilage that make up the windpipe when the dog pulls. Every time the windpipe is restricted it becomes increasingly damaged. Raspy breathing is a sign that the trachea is being crushed. Eventually, the dog will have breathing problems even when he's not being walked. When preparing for off leash, walking or training the dog on a tight leash, or allowing the dog to pull, is a set up for failure and disaster. When the dog no longer feels the restraint of the leash he will know he's free, and will usually take off. In order to achieve off leash reliability, the dog must be trained correctly on leash. 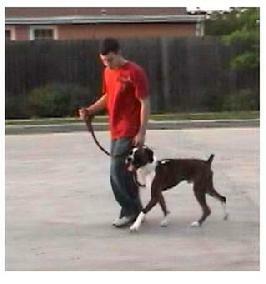 Our program instructs the owner how to teach their dog to maintain slack in the leash at all times. Dog's learn to work consistently and reliably both on and off leash. Another all too familiar scenario. Dog gets off the leash and darts out in front of a car. The owner, now at the Vet Clinic with her injured dog and treat bag at her side. This time the squirrel was more important than the "training biscuit" and desperate cries of TREAT, TREAT. Powerless, she could only stand by and watch her beloved pet get run over.